Welcome to the Brenta Dolomites, one of the most spectacular hiking destinations in the Italian Alps! 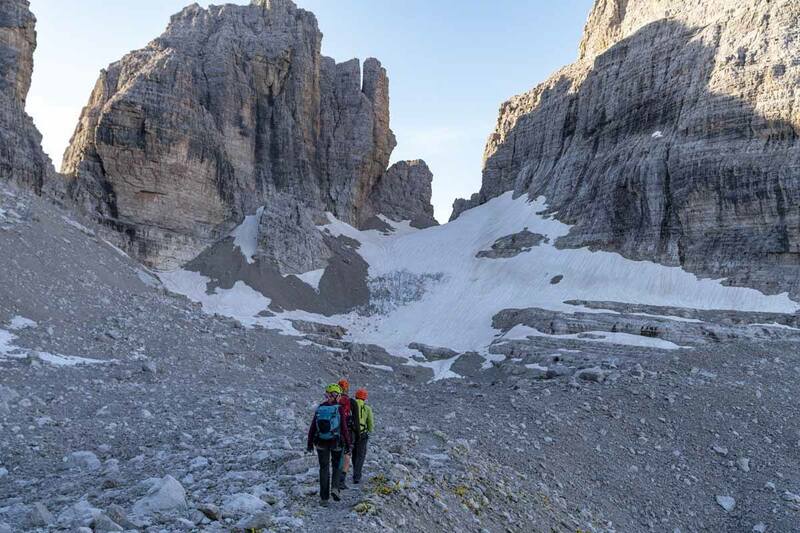 Here’s all about our three-day Brenta Dolomites hiking adventure in Trentino, the best place in Italy for adventure lovers! Adventure-lovers, please write this down. Trentino. You need to go. I know, you’ll probably be thinking that Italy doesn’t immediately spell ‘adventure’, it’s more of a food/relax/culture destination, but this mountainous region in far northern Italy is a whole different story. 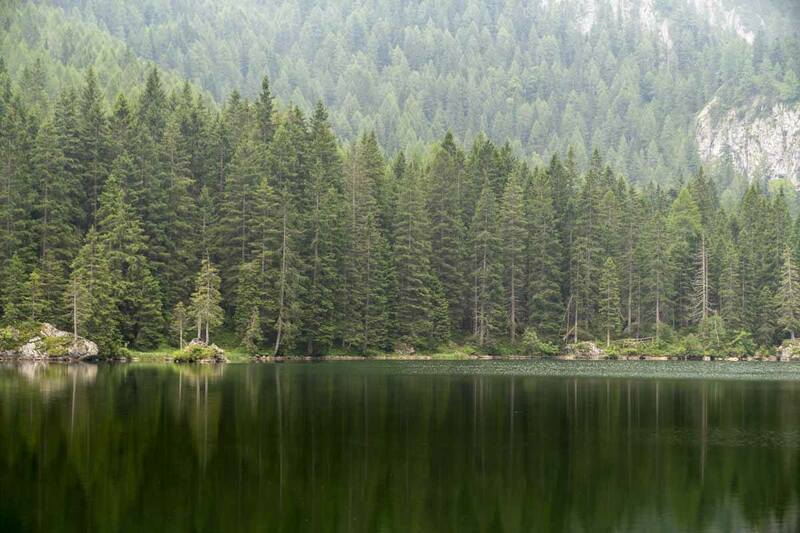 Trentino is – by far – the best place in Italy for adventure lovers. Trentino is home to a great variety of landscapes – green hills, flowery meadows and mountain pastures; fast-flowing rivers surrounded by vineyards, apple orchards and olive groves; high mountain peaks with perennial glaciers and moon-like vistas; Alpine lakes to relax and dip your feet after a day spent hiking. How about jumping in this lake? In Trentino you’ll also find the northern shore of Lake Garda, a region we covered widely on this blog – over the last year, we visited the Garda Trentino about half a dozen times, to hike GardaTrek, go climbing in Arco and enjoy all the other wonderful things to do around Riva del Garda. The hikes we did around Lake Garda were all easy/moderate – hikes that can easily be undertaken with no special equipment and no guide, provided you can read a map and are a confident hiker. 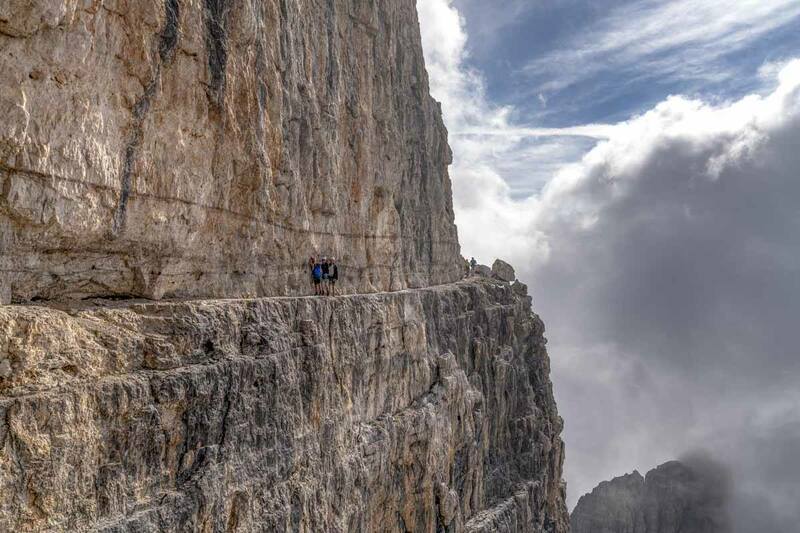 If you want something a little more extreme, you’ll have to head higher – to the Dolomites, those stark peaks that have challenged the spirit and imagination of mountaineers for centuries, and pushed many adventurers to their true limits. 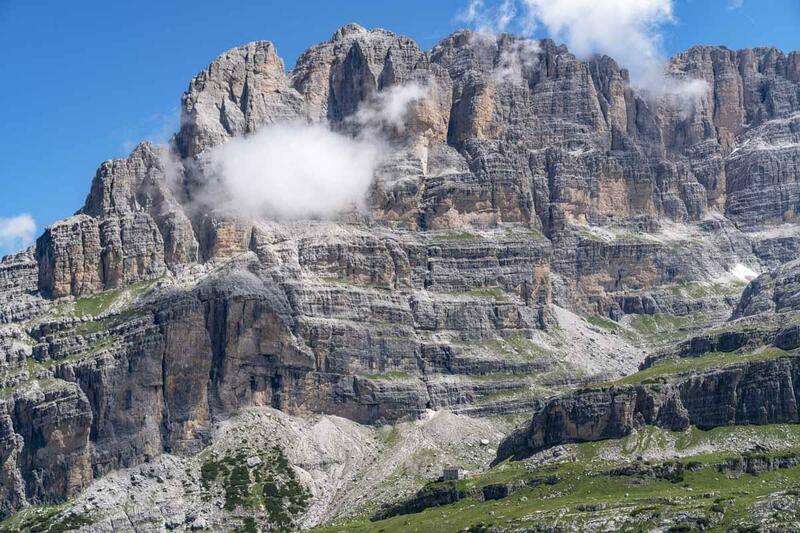 The Dolomites take their name from their signature pale rock, a magnesium-rich limestone. Most of the Dolomites are located east of the Adige River, up to Cortina d’Ampezzo over the border in Veneto – however, this article will focus on the Brenta Dolomites, located further west near the border with Lombardy. In July 2018, we went on a three day hut-to-hut hike across the Brenta Dolomites, covering over 30 km and 2300 meters altitude difference. 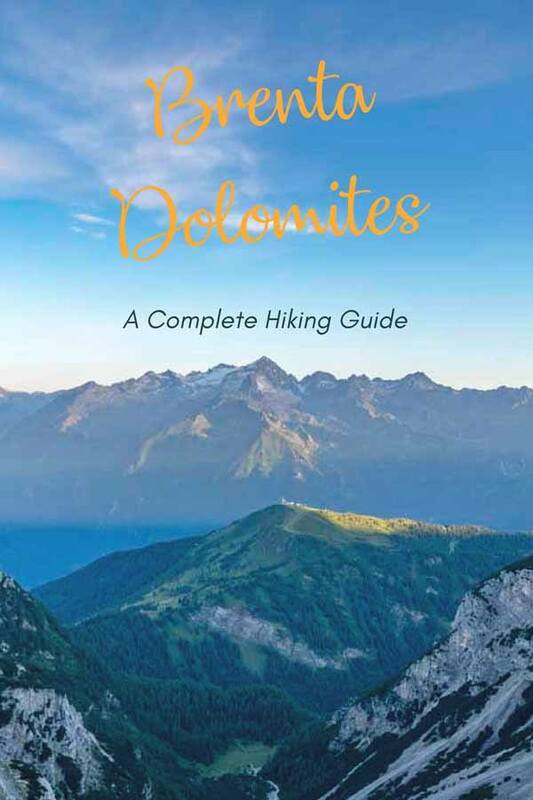 Here’s all you need to plan your very own Brenta Dolomites hiking adventure! Conclusions – How Was Our Experience Hiking the Brenta Dolomites? Brenta is the only Dolomites group located west of the Adige River, in the westernmost part of Trentino, and they’ve been listed by UNESCO World Heritage since 2009. The best place to choose as a ‘base’ to explore the Brenta Dolomites is Madonna di Campiglio, a great ski resort and glamorous mountain village that was already a popular tourist destination during Habsburg times. You can opt to stay in Madonna di Campiglio and go on day hikes around Brenta – from the centre of the village you can catch a shuttle bus to Vallesinella, close to various trailheads, or take the Campiglio-Pinzolo Express cable car from Colarin (close to the centre of Campiglio) to Plaza. Tickets for the shuttle bus and Campiglio-Pinzolo cable car are €2 per journey, or you can get a day pass for €7. Alternatively, from Campiglio you can head down to Pinzolo, and from there catch the Doss del Sabion cable car, from where you can begin several hikes. Tickets for this cable car are €10 one way, or €13 return. Summer is by far the best time to hike the Brenta Dolomites. 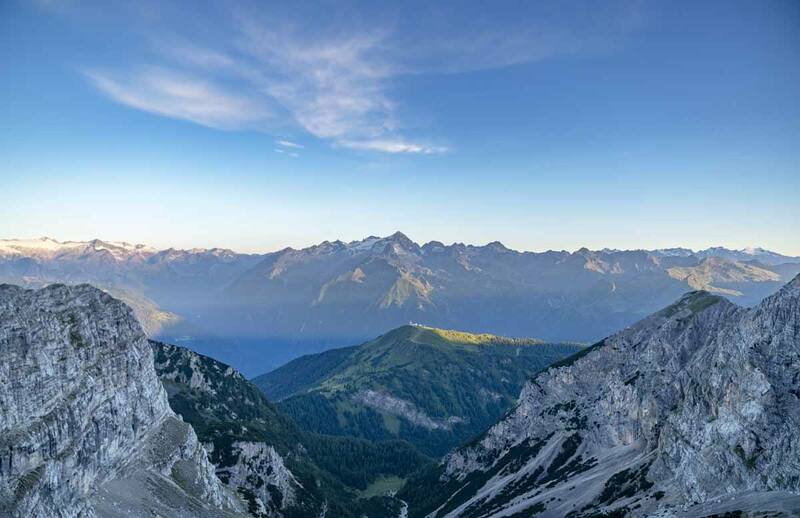 Most hiking around those parts is fairly high altitude – to give you an idea, Madonna di Campiglio itself is at 1522 meters above sea level, and depending on what hike you opt for, you’ll usually be between 2000 and 3000 meters. 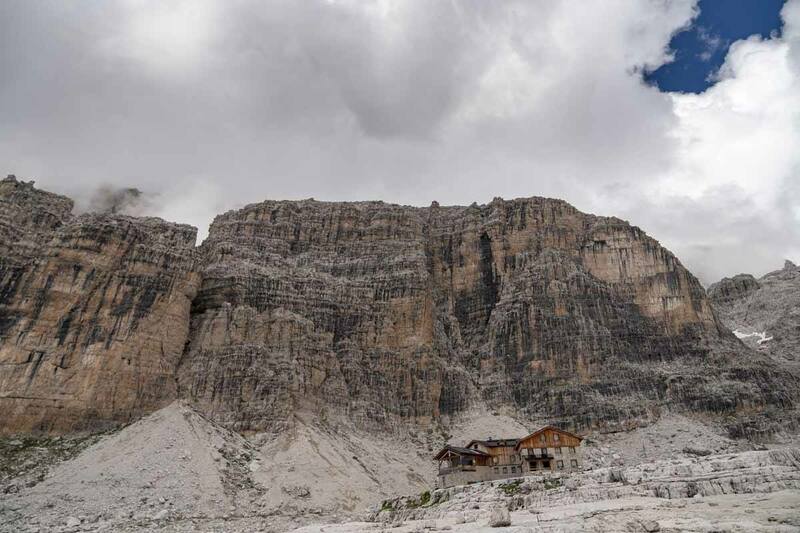 Not to mention, all rifugi (mountain huts) in the Brenta Dolomites are typically open only between June 20th and September 20th – however, opening dates are sometimes extended to late September or even early October. Phone ahead to check if you’re planning to visit outside of the official opening season. To get the best weather conditions, plan to visit in July/August – storms may still occur, and weather forecasts are usually unreliable, but it really is the best time of the year to visit if you want to hike. If you’re lucky, you’ll have days like this! 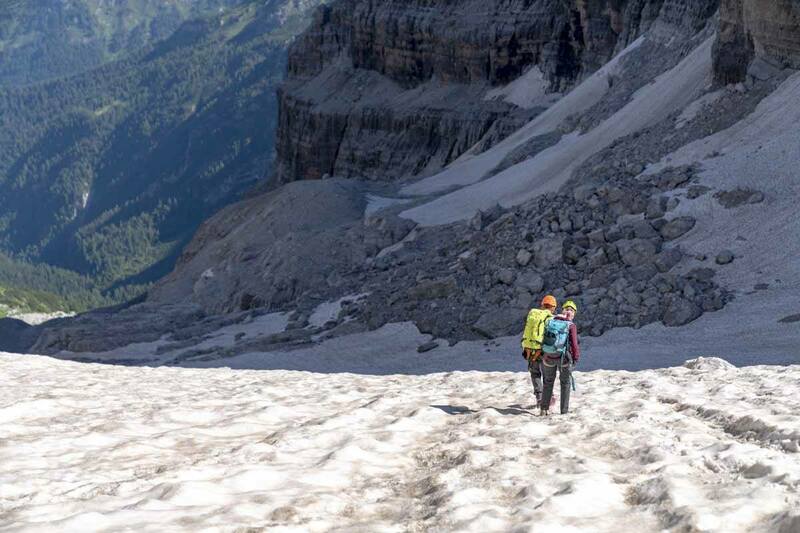 If you want to reach the Brenta peaks, want to hike some vie ferrate or cross some exposed/snowy sections, we highly recommend doing so with a qualified Alpine guide – our guide was the unstoppable Ezio from Mountainfriends in Pinzolo, and we recommend him highly. If you’re heading to the Brenta Dolomites in winter, you can go skiing at the spectacular Campiglio Dolomiti ski area, with over 150 km slopes including some world cup runs. Ski mountaineering is also popular, if you’re a proficient skier. We summarised the equipment we take when we go hiking on our long-distance hiking packing list. 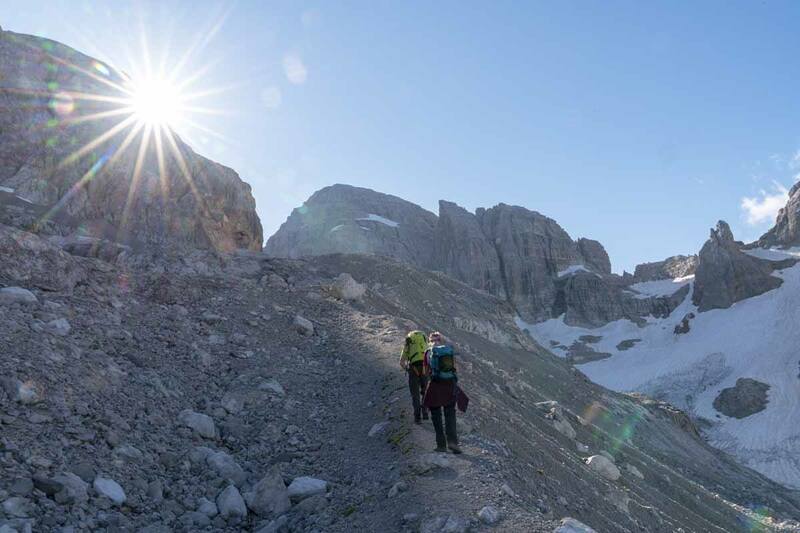 However, since you’ll be above 2000 meters while hiking the Brenta Dolomites, it will be cold at night – make sure you take a warm fleece or down jacket to wear once the sun goes down. We also recommend using sturdy hiking boots on a hike like this, not trail shoes, since you’ll be crossing snowy patches and might have to use crampons. Also, please remember that a sleep sheet is compulsory to use at mountain huts. Don’t forget to pack your own, or buy a disposable one (for a price!) from the huts themselves. 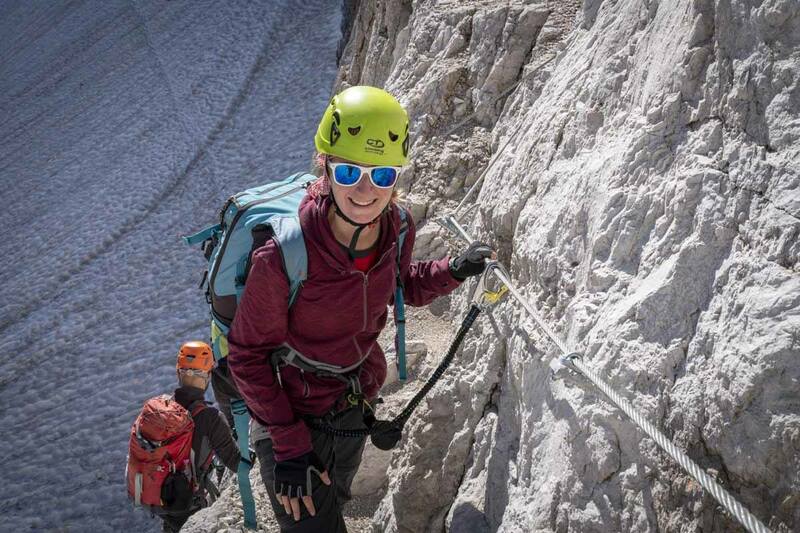 If you’re planning to do a via ferrata or sentiero attrezzato, don’t forget to pack your helmet, harness, gloves and via ferrata lanyard, as well as crampons in case of snow. All this equipment can also be provided by your Alpine guide for an extra fee, if you don’t have your own. If you’re visiting the Brenta Dolomites, chances are you’ll be spending at least one night in Madonna di Campiglio, where you’ll find lots of accommodation and restaurant options. 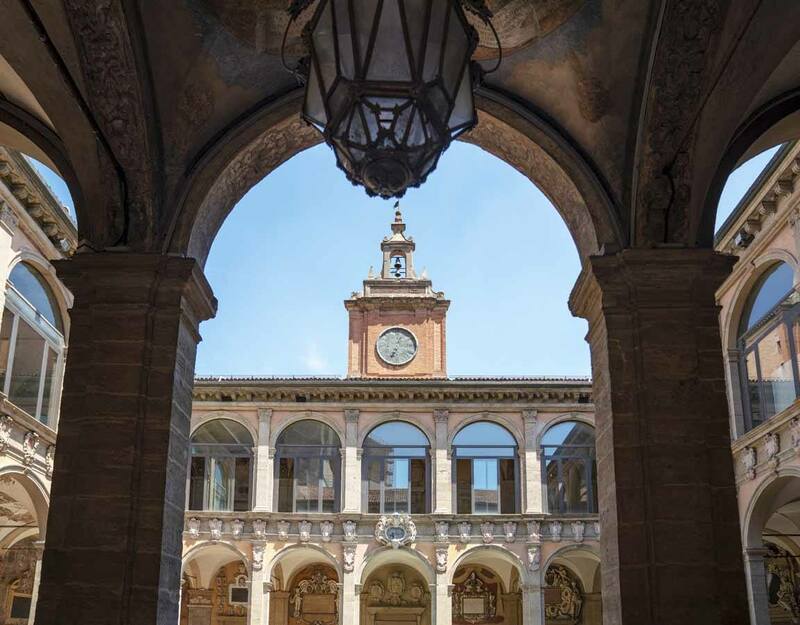 The level of hospitality is really excellent throughout Trentino – people are kind and welcoming, tourists are treated well and horror stories about scams and overcharging (sadly a regular occurrence all over Italy) are virtually unknown. In Madonna di Campiglio, we recommend staying at Hotel Bertelli, located just 10 minutes uphill from the town centre, in a stunning panoramic position with a view over the Brenta Dolomites. The hotel has large, bright rooms and suites, with furniture and panelling made with local wood, and there is also a SPA with a pool, sauna and steam bath. If you want to sample the flavours of Trentino before heading to the mountains, there are two restaurants – one where breakfast, lunch and dinner are served to hotel guests, hearty meals making use of traditional produce, and a Michelin starred ‘taverna’ called Il Gallo Cedrone, offering a modern and refined take on mountain cuisine. Don’t worry, the Rifugio is just a little further! 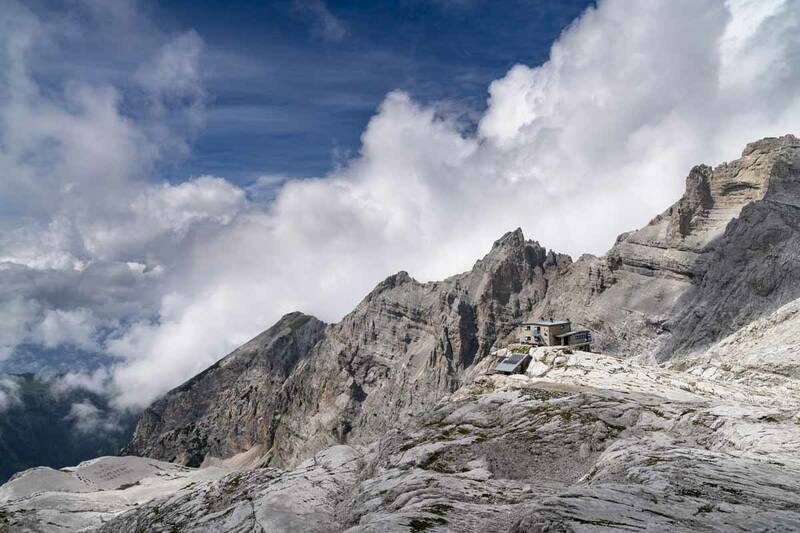 When you’re hiking the Brenta Dolomites, you’ll be staying at mountain huts. If you’ve never stayed in a mountain hut, we recommend reading this excellent article – services and facilities are not the same as you’ll find in the towns and villages, rooms and toilets are almost always shared. Food is usually hearty and filling, but don’t expect fine dining or dietary requirements to be catered for. We stayed in two mountain huts during our hut-to-hut hike around the Brenta Dolomites – Rifugio XII Apostoli and Rifugio Alimonta. 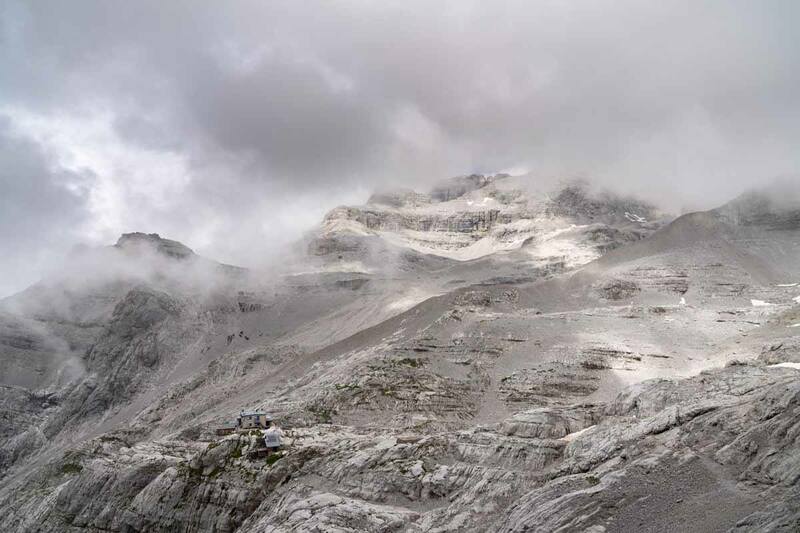 Both mountain huts are in scenic locations at around 2500 meters above sea level, offer accommodation in communal dorms and have truly spectacular views over the Brenta and Adamello/Presanella group. Our hike around the Brenta Dolomites started from a location not far from Sant’Antonio di Mavignola, where we followed signposts to Val Brenta and Valagola. From Madonna di Campiglio, the best way to reach the trailhead is taking the Campiglio-Pinzolo Express to the Plaza station, and following signs from there. The first stage of our hike started with a leisurely ascent through a pine grove, on a wide forest road. It was a cloudy day, and even started raining a bit – but luckily, by the time we reached the first stop, pretty Lake Valagola, it had all but stopped. Lake Valagola will probably be the last large body of water you’ll see for the duration of this hike – the Brenta Dolomites are known for their stark, arid moon-like landscape. You’ll be surrounded by rock spires and dramatic formation, but not much green. After leaving the lake behind, and crossing a gravel plain known as Lago Asciutto (Dry Lake), tall pine trees slowly started to be replaced by smaller pino mugo plants, only reaching as far as our hips. The wide forest road became a narrow trail, crossing the moraines deposited on the mountainside by millions of years of retreating glaciers. We climbed steeper and steeper, until we reached the Scala Santa, a rocky path right on the mountainside, with a security cable to hold on to. From the top of the Scala Santa, Rifugio XII Apostoli can be seen, almost camouflaged by the rocks surrounding it, the exact same shade of pale grey. From there, there was only about half an hour to go, climbing gradually, until the Rifugio with its blue and white shutters appeared before us. Dinner is usually served around 7 pm in the Rifugio – if you arrive earlier, you could visit the small church dug into the mountainside about 10 minutes walk away, dedicated to all those who died in the mountains. The church is completely covered by plaques remembering fallen mountaineers – a stark reminder that in the high mountains, humans are only temporary visitors. Another location you could visit are the Dodici Apostoli (Twelve Apostles), a rock formation after which the mountain hut is named, very vaguely reminiscent of 12 portly men sitting down for a kind of last supper, which can be found just below the pass located behind the rock church, right below the peak in the picture below – which funnily enough, is also called Cima Dodici Apostoli. However, the path is very exposed and can be slippery, and it may be hard to locate the rock formation if you don’t know what you’re looking for – we recommend this detour only with a guide. Can you spot the 12 Apostles? Staying at Rifugio XII Apostoli is a quintessential ‘mountain experience’ – the hut only sleeps 38 and it is run by Aldo, an Alpine guide and one of those mountain people that can’t help being gruff and endearing at the same time. The menu includes two first courses and two second courses to choose from – half board is €53 per person (€42 for mountain club members) and allows you to have one of each. 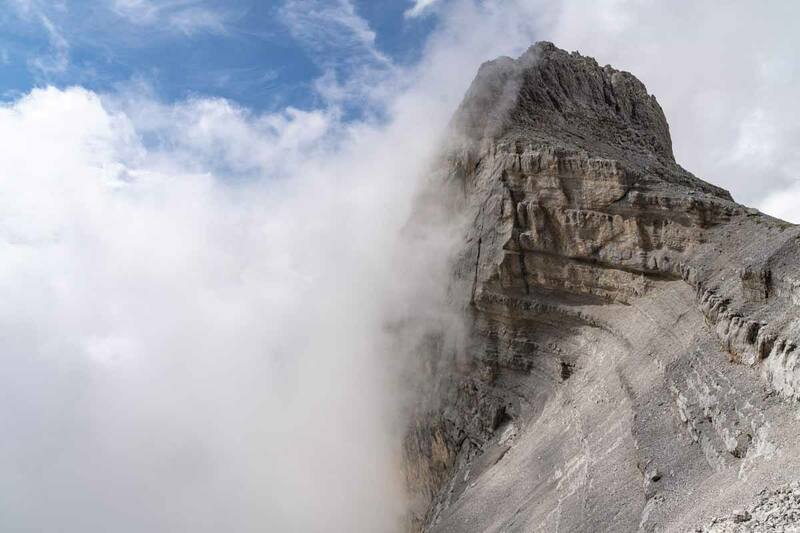 The following day we woke to a spectacular sunrise – the clouds that accompanied for the whole first day had lifted, revealing the imposing profile of the Presanella, the highest peak entirely located within Trentino. What about waking up with this view? 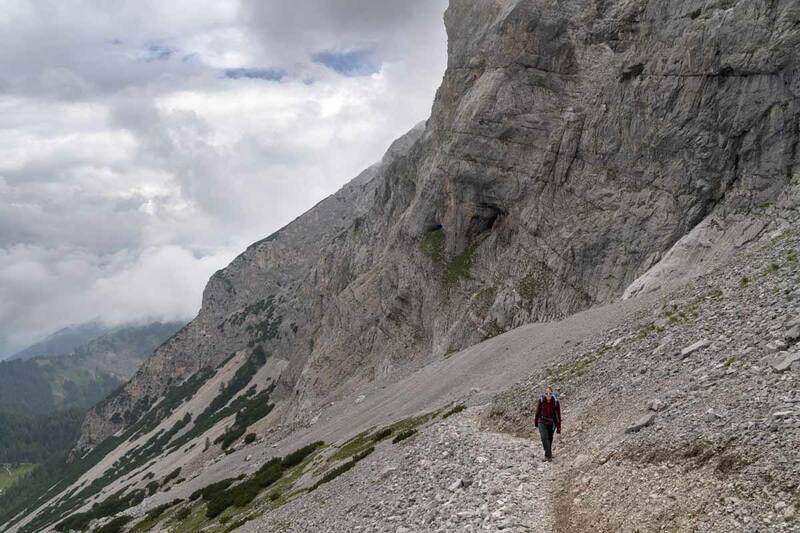 From this point onwards, having a qualified Alpine guide with you is essential – part of the stage is along a Sentiero Alpinistico, a trail with fixed steel cables, steps and ladders to cross exposed sections. Moreover, you’ll probably need to use crampons, as some sections are covered in snow year round. The Sentiero Alpinistico is dedicated to Daniele Martinazzi, a solo hiker who disappeared in the middle of last century and was found only seventeen years later, buried under a glacier. From Rifugio XII Apostoli, we climbed a steep section heading towards the Forcella dei Camosci, a small mountain pass where chamois are often seen, before descending again on the opposite side, a steep and narrow snow-covered rill surrounded by the watchful eye of Crozzon del Brenta and Cima Tosa, the highest peak in the Brenta group. This is the most technically challenging section of the day – first, you have to climb down with the aid of cables and steps, then cross a snowy rill, which becomes steeper and steeper as you near the bottom. If your guide deems it safe enough, you can proceed to the bottom of the snowy section, roped up and using crampons – however, I felt nervous and preferred following the less steep rocky section on the right hand side of the rill, which included a further section with cables and ladders towards the end. After completing this section, you’ll be only about 40 minutes away from Rifugio Brentei, a super-scenic mountain hut a little further down, surrounded by green fields and jagged rocks. Brentei is an easy hike from the bottom of the valley, and it’s very popular with day trippers – you may find it a bit crowded after spending time in the high mountains, where only a few brave souls dare to venture. From Brentei, it’s about a further hour up to Rifugio Alimonta, where we stayed at the end of our second day hiking the Brenta Dolomites. There’s an easy path leading to the Rifugio, but we took the ‘Variante Ezio’, a secret path discovered by our mountain guide, steeper but more scenic and far less crowded than the regular path. Rifugio Alimonta is one of our favourite places on the planet. It’s set in a stunning rocky amphiteatre almost at 2600 meters above sea level, right in the heart of the Brenta Dolomites. This Rifugio is privately owned – it’s a bit more expensive (€62 per person with half board) but accommodation and food are definitely higher level compared to most mountain huts owned by Alpine clubs. We ate delicious canederli (bread dumplings topped with melted butter), and omelettes stuffed with speck (traditional cured, smoked ham) and cheese. Just what we needed after a day spent hiking! Our third day in the Brenta Dolomites was dedicated to the Bocchette Centrali via ferrata, one of the most scenic in the Alps. 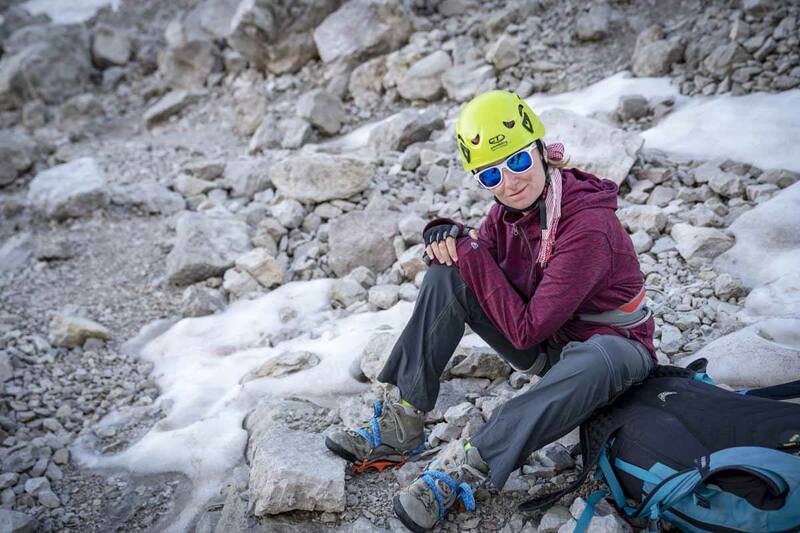 Vie ferrate are protected climbing routes, allowing you to make your way across steep, exposed sections with the aid of steel cables, steps and ladders. A via ferrata differs from a sentiero alpinistico (also known as sentiero attrezzato) because typically a via ferrata presents cables and climbing aids for the majority of its route, whether in a sentiero alpinistico you’ll find them only in some isolated steep or exposed sections – as we experienced the previous day on our way between Rifugio XII Apostoli and Brentei. The Bocchette Centrali via ferrata takes about three hours from start to finish, and unlike most vie ferrate that develop vertically, starting from the bottom and gradually climbing to the top, it follows a horizontal route, taking advantage of natural ledges. As a result, this via ferrata is not technically difficult, but it’s very exposed – you’ll be walking along a narrow ledge for most of the three hours, with a 500 m drop on the other side. If you don’t like heights, this is not a place for you. 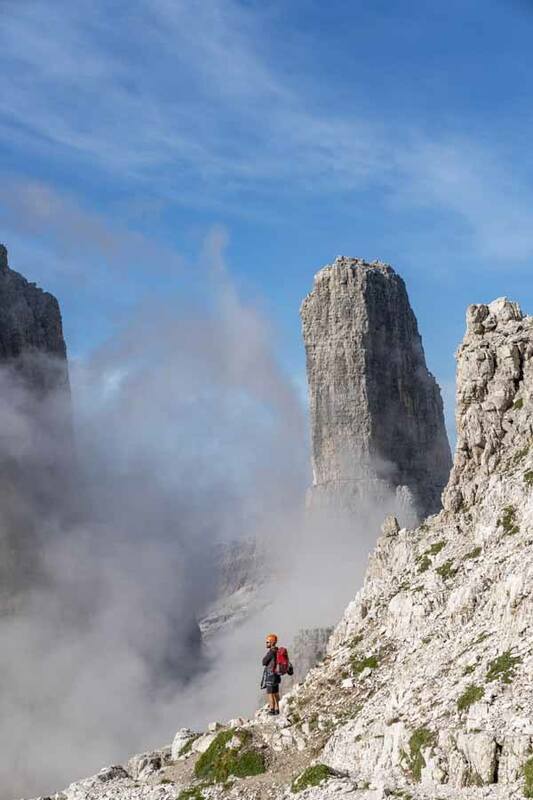 The main drawcard of the Bocchette Centrali are the stunning views over some of the most iconic rock formations of the Brenta Dolomites – the highlight were our views of Campanile Basso, where we also saw some daredevil climbers making their way to the top. 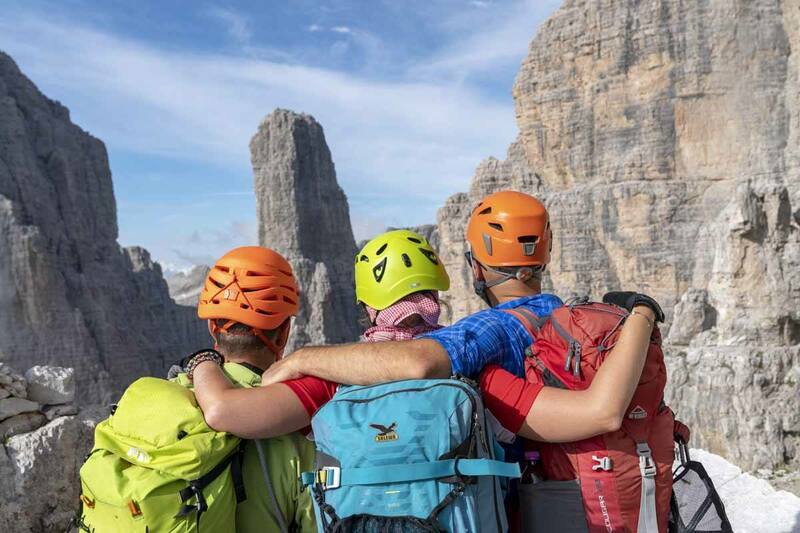 In a couple of weeks, I’m going to publish a post dedicated to the Bocchette Centrali via ferrata and how it was created, including other info on vie ferrate around the Brenta Dolomites, if you’re looking for extra info. After getting to the end of the Bocchette Centrali, it’s about a further hour across a rocky section and then a comfortable path to Rifugio Brentei, where you can for lunch. Alternatively, if you’re on your way back down to the valley, you can keep walking towards Rifugio Casinei, following a scenic but easy path with great views over the Brenta Dolomites, as you slowly leave them behind. Eat your fill at Rifugio Casinei – we were absolutely famished by the time we reached it, and enjoyed a huge platter with cured meats and cheeses and some strangolapreti (spinach and ricotta dumplings). After lunch, we walked a further 40 minutes through a pine forest to Vallesinella, where we caught the shuttle bus back to Madonna di Campiglio. 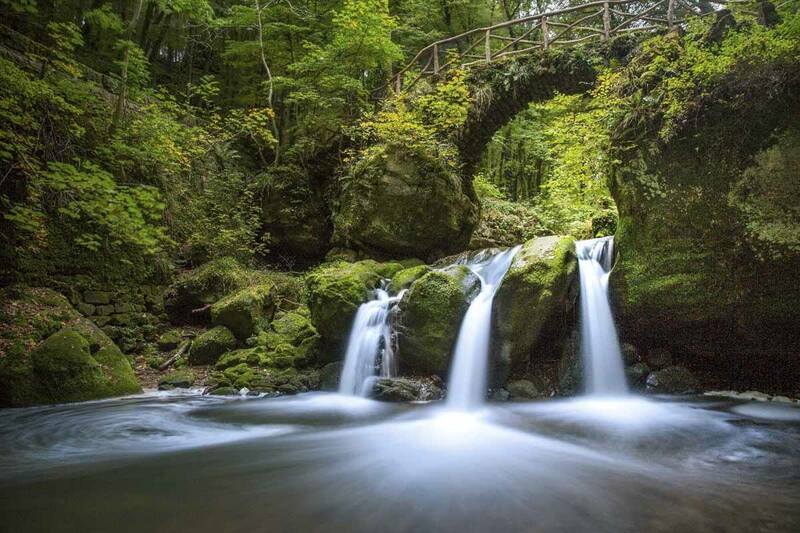 If you still have some energy left, there’s a small detour you can take in Vallesinella, taking you to some stunning waterfalls. 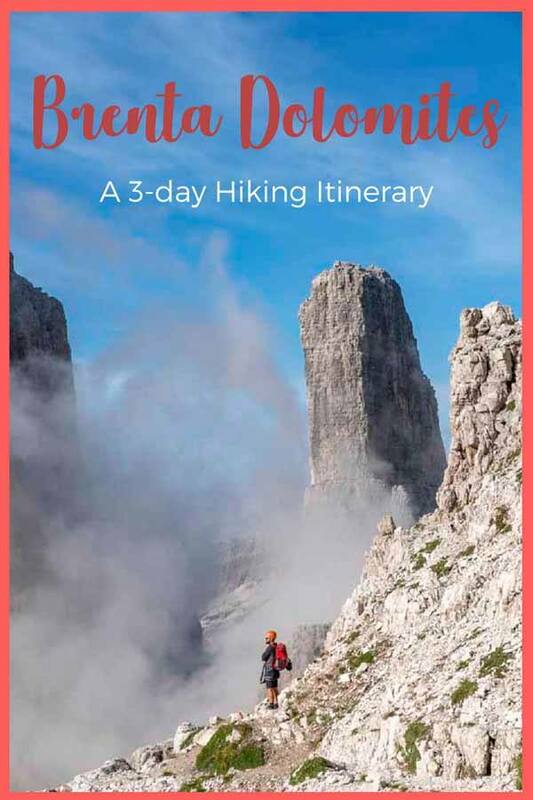 Our three days hiking the Brenta Dolomites were truly one of the best experiences of our entire lives – but they’re not for the faint of heart! The days were long and challenging, and since we covered a lot of steep, exposed sections during day 2 and 3, we were exhausted at the end – both physically and mentally. We wouldn’t recommend this entire itinerary to first-time hikers – if that’s you, just hike to Rifugio Brentei or even Alimonta and back. 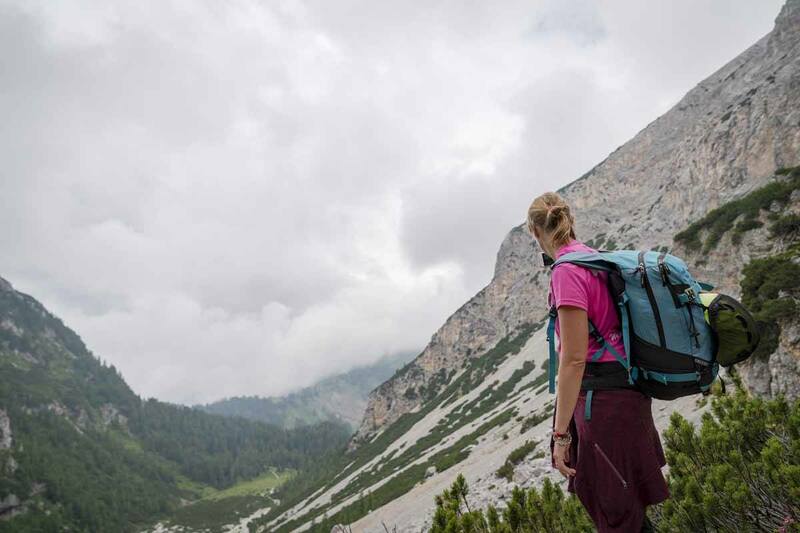 If you’re a confident hiker and don’t mind heights, then you’ll love this hike – it’s a great introduction to the Brenta Dolomites and its beautiful landscapes. Just one last word of warning – unless you’re very, very experienced in the mountains, don’t attempt this hike without a qualified guide. The weather can change very quickly and on steep sections you just need a tumble to turn an adventure into a tragedy. An Alpine guide will also provide you with invaluable info about local culture, nature and customs – and if your guide is as cool as our Ezio, you’ll have the the time of your lives! Our experience hiking the Brenta Dolomites was in collaboration with Trentino Marketing. We would like to thank Ezio and Roberto for being amazing travel companions, and Chiara for all your help and support!